Update: Check out the monthly updates on this experiment. Do you think you’re a below-average driver? Of course not. Everyone thinks they’re above-average. This is why I’m a big proponent of the “Core and Explore” or “Play” portfolio. You should set aside a small percentage of your portfolio and try your best to beat a passive benchmark. If you track things carefully, chances are that after a few years you’ll discover you really aren’t so good and hopefully end up settling into the slight-but-guaranteed outperformance of low-cost, passive investing. Or, you’ll find you’re meant to be a rich and successful hedge fund manager. Win-win! I’ve been running a little side portfolio for years, but I haven’t been following my own advice about tracking my relative performance. I think it’s time. I’m taking $30,000 and using it for my “Beat the Market” experiment. This is less than 5% of my actual portfolio, which is still overwhelmingly in low-cost index funds rebalanced to a target asset allocation. 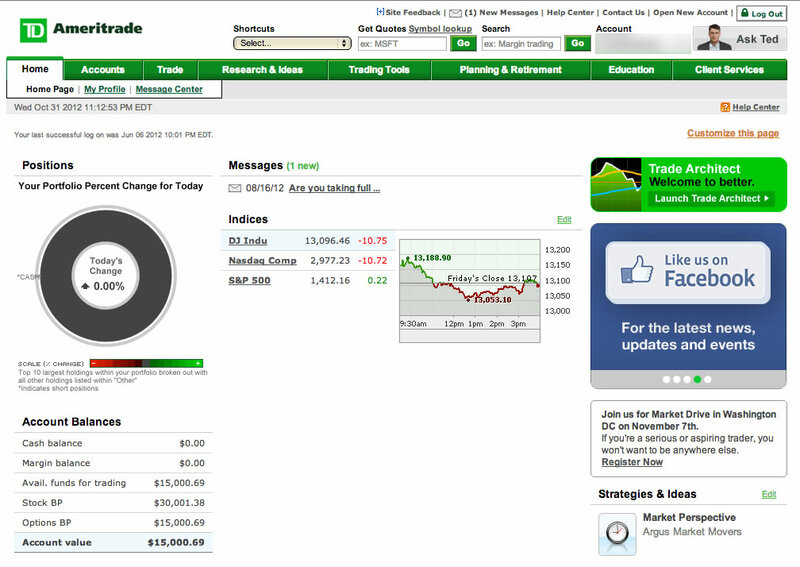 I’ll track the balances monthly with actual screenshots starting today, November 1st, 2012. Here’s how I’m breaking it down. My real portfolio is held primarily at Vanguard and Fidelity but also includes non-index funds due to limited 401k choices. To create a separate benchmark, I opened a new account at TD Ameritrade as they offer 100 of the most popular ETFs commission-free, including the Vanguard and iShares ETFs that I use. My benchmark portfolio will be based on my usual target asset allocation, except fully-invested in 100% stocks (details coming). As the portfolio will consist of commission-free ETFs and there are no maintenance or service fees, the overall cost drag should be very, very low. I will not make any deposits or withdrawals to this account, and will report the total balance on a monthly basis. I suppose I could also track after-tax efficiency, but that sounds like too much work and most people invest predominantly in 401k’s and IRAs anyway. I wanted to start this consumer lending comparison earlier, but life happened and things got delayed. 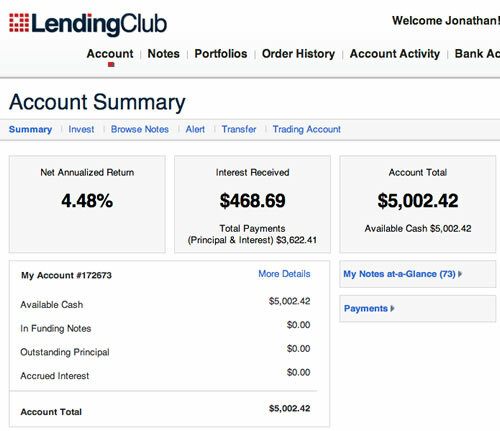 Now, I have liquidated my meager LendingClub holdings and put in $5,000 cash. 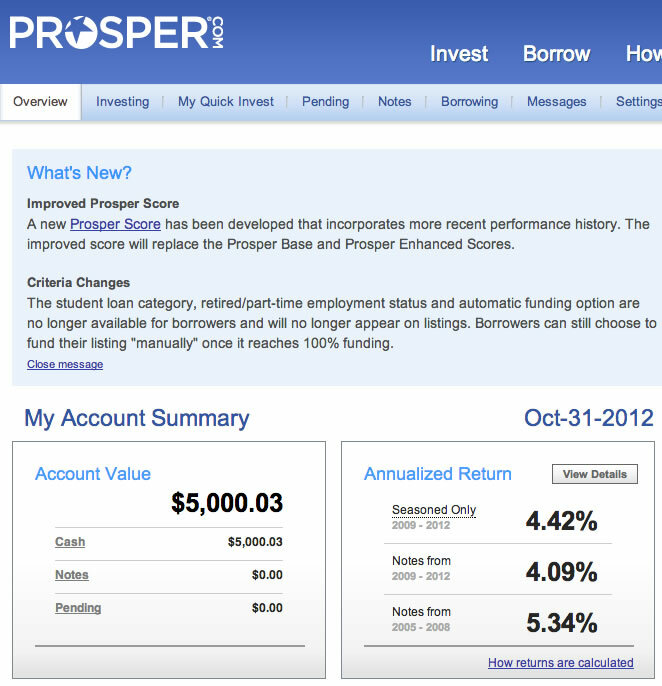 I will pick loans to create a loan portfolio using simple filters and auto-invest features to save time. I’ll start looking to add loans on November 1st, but it may take a while to fully invest all the funds. Again, I won’t make any deposits or withdrawals, and will report the balance monthly. 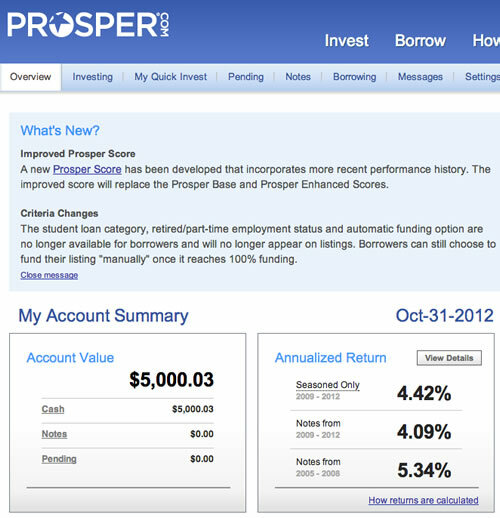 Same as above, but with Prosper Lending. I also liquidated my Prosper holdings and put back $5,000 in cash. 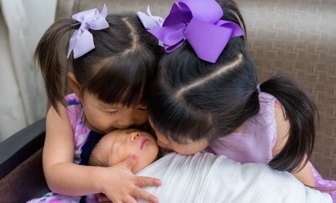 Together, this is another $10,000 alternative-investment portfolio. I’ll try to run these competing portfolios for as long as possible, I’d like it to be more of a long-term comparison if possible. I think it should be interesting. This is a seriously cool idea. I think this is a great idea and will seriously consider something like this when I’m a bit further down my early retirement path. Jonathan, this is a great experiment not just for you but for us as well. With the monthly updates you will be motivated to keep a tab on the experiment and we will be able to learn from the results. Great idea! It will be interesting to follow these “apples to apples” comparisons. 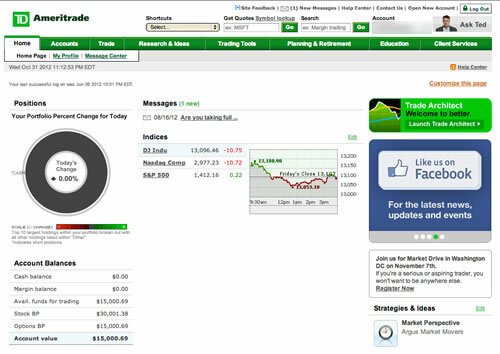 If you put more money in the brokerage account, you can often get a significant number of free trades (e.g. Wellstrade). So, if you are an active investor, that changes the comparison, and thus the numbers. If not, then a disclaimer should be added. This is a good idea, but I have to wonder, is there some reason you are doing this with real money, particularly your “Good Boy” benchmark? There are many places where you can set up a virtual portfolio and make trades to see how your strategies work – the easiest is probably finance.yahoo.com or google.com/finance, but many of the brokerages have similar things, including OptionsHouse and thinkorswim. The most interesting one I found is on MarketWatchm where you can create a game (marketwatch.com/game) and invite friends to compete to see who does the best. @ttfitz – That’s a good question. The overall answer is that paper or virtual trading is never the same as actually risking your own money. The details are where things get interesting. As I went online today and bought the ETFs to fill out the Good Boy portfolio, I realized this. For example, many beginner investors have questions like how do you actually build such a portfolio? Many little things that I do by habit are not necessarily obvious. For example, I never place a trade in the first or last hour of market trading, in order to have better liquidity/volume. I always use limit orders, not market. (I also prefer mutual funds if they aren’t more expensive so I don’t have to worry about these things.) I’ll probably expand this into a post. I wondered if that might be the reason. I know what you mean – a number of years ago I was doing the virtual portfolio thing, and Krispy Kreme doughnuts was the flavor of the day (I am 50 years old and grew up with Krispy Kreme, but apparently once they expanded into places like LA, they got hot and trendy). The stock went WAY up, much more than seemed reasonable, so I sold short a bunch of Krispy Kreme stock in the virtual portfolio – to a degree I never would have in real money (and probably wouldn’t have been able to, given the number of shares outstanding at the time). Made a killing when it dropped like a rock, but still too scary for realsies. I think I’d still have done the Good Boy portfolio that way, if nothing else to have the money to use in the Bad Boy portfolio – if you want to trade options like you mention, $10,000 account is going to be really tight for most strategies there, given the 100-share lots that options involve. This should provide some insight into the pros and cons of trading too much. How much time do you have to devote to your play 5%? This is cool but what if you did in 2008, they all would have lost? I love how your blog still isn’t super commercial. I feel like all the other old blogs I’ve kept up with now have lots of authors and don’t feel very personal. I feel like we all get consistent posts from only you. Keep it up! 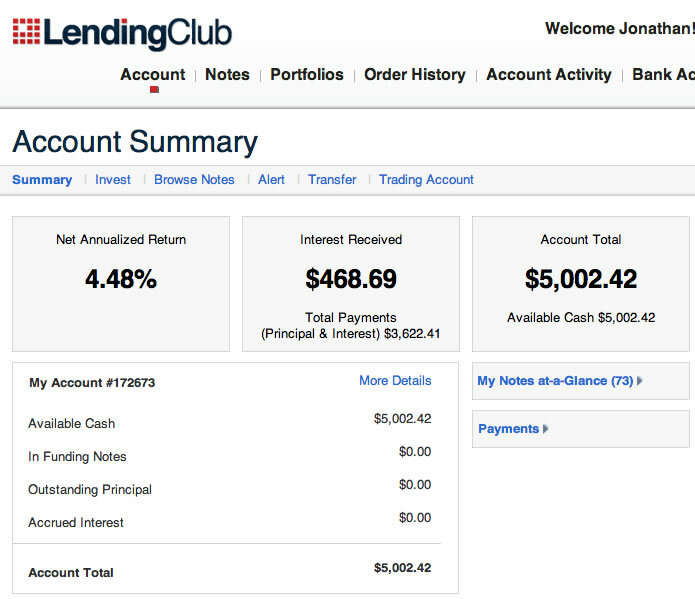 I’ve had a lending club for 3 years (only $500). Made a net annualized return of 8.85% according to their calculations. Only 1 out 18 loans went under and was charged off though. How come your returns are so low? Do you invest in only the ‘A’ grade loans? I feel like we should all put all our money into these systems if these returns are consistent! If you end up getting a higher return in #2 or #3, how will you know that it’s not simply due to there being a higher risk and reward? I guess what I’m asking is: will you also compare volatility of the different approaches? Fun exercise but not really sure what it will tell you. If you make a few good picks your actively managed portfolio will win. If you miss on a few it will lose. But that doesn’t really tell you much about how it will do for the long term. Over what time period would you have to beat the market to feel confident that you are actually beating it and it is not just variance? @T – Yes, in the past I was ultra-conservative with A-AA loans only. This time around I’m taking more risk as their interest-rate algorithms are hopefully better. @Derek – One major goal of this experiment are hopefully to show people a way to vent their gambling/investing/trading urges in a manner that doesn’t blow up their portfolio. I don’t plan on declaring victory after a year, we’ll see what happens in 3,5,10 years. Hopefully I’ll be retired by then anyway. It will be interesting to see if there is a reversion to the mean as well. If I win big at first, will it even out? @Amy – I don’t plan on spending that much time on it, I don’t have time to read 10-Ks and things like that. I do read a lot of overall financial articles in any given day, so I’ll just get my betting ideas from those. @Erik – Agreed, you could open Wellstrade with 25k but you’ll also need an active checking account with them as they have gotten pretty strict about that. It’s interesting that no other bank has matched that offer, BofA requires 25k in cash, although at current interest rates that’s not actually that much lost interest. Yeah, right. Good luck with that. But what’s worst that can happen? Loose 5% of (600k+) portfolio. Big deal! Are you going to put up the results? Monthly? Quarterly? Jonathan, thanks for the response. I don’t really disagree with your focus on the bottom line. The reason I brought up risk is because #1 is using your (presumably) conservative allocation but #2 sounded like it was going to mostly just be stocks. In the long run, more risk usually is compensated by more reward, so it seems like ideally you’d compare mini-portfolios with similar risk (or maybe use risk-adjusted returns–if you can make sense of them) if you actually want to identify whether it was more skill or just more risk that (hopefully) helps #2 win out. I’m really interested in this experiment and have a bunch of questions on your trading account. Will you buy and hold? rebalance and how? Execute trades based on technical analysis (moving averages)? What will be your exit strategies on making trades? Are you going to trade any options? 🙂 Sorry for all the questions – I’m just looking forward to seeing this play out. I agree with the core and explore concept. It’s very instructional at the least. @Jared – It will always be hard to identify risk vs. skill, mostly it’s just for fun and to keep track. The benchmark portfolio will be 100% stocks as noted above, and will illustrate the potential benefit of being 100% invested at al times, through thick and thin. @Patrick – For now, it’ll just be trading without a rigorous algorithm. Right now no technical analysis, I’m not a fan of that even though moving averages has done well on a backtested basis. As I learn more, I’ll use whatever I can.